Motorola has unveiled the Moto X, a US-only smartphone that aims to offer customers an as yet unseen level of customisation when it comes to ordering your phone. The Moto X is the first smartphone to be launched representing the relationship between Google and Motorola which means you'll get untouched Android along with some unique features that won't be available on any other Android smartphones like the HTC One or the Samsung Galaxy S4. With a miniscule bezel the Moto X features a 4.7-inch 720p display which has been chosen intentionally over a Full-HD panel in order to give it a battery life that Motorola hopes will put its competitors to shame. On the back there's a 10-Megapixel camera which is capable of taking in 75 per cent more light in order to give excellent outdoor results whilst still making sure it doesn't suffer in low-light conditions. There's a Quick Capture feature which can be enabled by a simple double twist of the wrist, in all the whole process takes under two seconds whilst focus and exposure are handled by the handset. Motorola has also focused on its ability to function handsfree incorporating a similar technology to Google Glass which means a simple bark of 'OK Google Now' will start the phone listening and then carry out any requests you have. There's some impressive hardware as well with the Moto X sporting not one but two 1.7GHz dual-core Snapdragon S4 processors along with 2GB RAM and the option of either 16GB or 32GB internal storage. Last but not least is Google's trump card which comes in the form of true customisation. Customers will need to log onto a dedicated site where they can customise everything from the colour of the handset to the type of backplate which as you can see from the image, will include a real wood option. Custom wallpapers and personalised inscriptions are also present and thanks to the Moto X being made in the USA Motorola and Google are suggesting that customers will get their smartphone just four days after ordering. Sound too good to be true? Well sadly for UK Android fans it is as the Moto X will only be available in the US for the time being. Motorola have confirmed that there will be higher-specced handsets on the way featuring the new Google ethos so it's not all bad news. 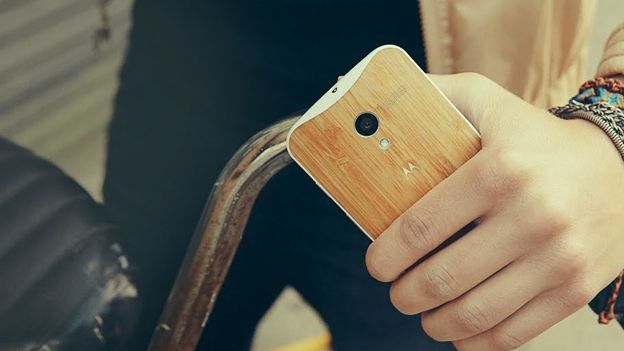 Want more on the Moto X? Watch the video below to see the new Android in action. For more tech videos, subscribe to the T3 YouTube channel.